The Tesla drone concept is a drone design that appeared in somewhat of an unlikely place. Bēhance, a platform to showcase & discover creative work, recently featured the Tesla drone. Now while the design looks legit, it’s not a real Tesla design, but rather an imagining of what a drone might look like if it were to be manufactured by Tesla Motors. The design is work from Fraser Leid of Milton Keynes, United Kingdom. 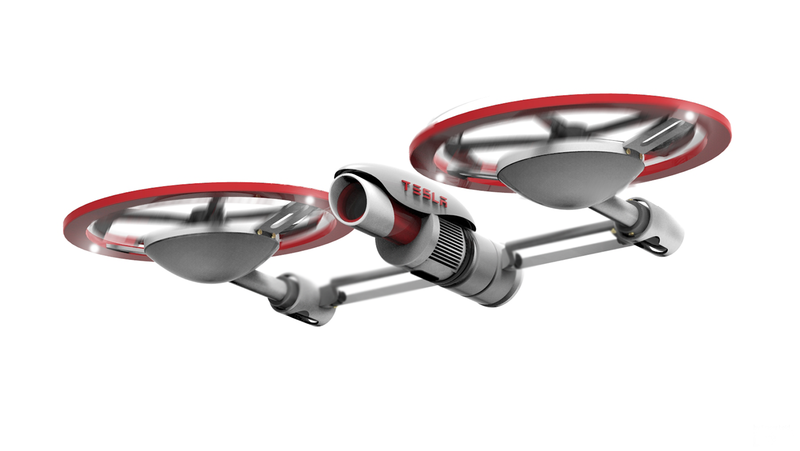 Introducing the Tesla Drone, a unique reinterpretation of drone ingenuity. Its design aesthetic was focused towards two things: redefining longevity and perception. The common issue with drones today is their lack of battery capacity, which in turn, limits their flight time to 20 minutes and their charging time to an hour. 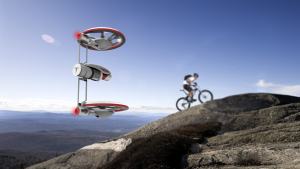 The Tesla drone incorporates an advanced 10 000 mAh Lithium-Ion (Tesla Powercell®) battery, capable of prolonged flight lasting up to an hour on a single charge. The second key component was related to design and straying away from convention. By not replicating a Quadcopter, but innovating a new twin blade design that allows the propellers to act as the drone camera’s stabiliser, a gimbal isn’t required for video stability. It was about time someone would imagine a UAV inspired by the Tesla Model S that eco-conscious drivers could use to film their Ludicrous mode sessions. After all, isn’t Elon Musk’s premium EV all about ground-breaking design, counter-fighting range anxiety and futuristic technology? Now, the creator of the new unmanned aerial vehicle, the Tesla Drone, hopes to make this type of cinematography even more flexible and smooth. Designed by Cape Town, South Africa-born industrial designer Fraser Leid (now based in London), the Tesla Drone is billed a reinterpretation of drone ingenuity. However, plausible and well executed, it is just a design concept.